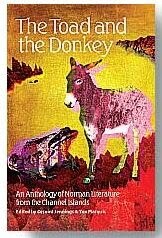 Just a quick update to say that I received a note from Geraint Jennings that his book with Jan Marquis ‘The Toad and the Donkey’ is now published. More information here. Here is an excellent poem in Channel Island French by Geraint, and its translation below. lé couochant lanche des pétales d’rose sus les côtis. d’la mathe tchi m’fliatte atout eune fliotte dé caûques-souôthis. entouortilyis dé veîl’yes dé r’lié et d’amèrdoux. ont voltilyi par ‘chîn, par là – des vielles d’avoût. rôdant les c’mîns à la r’vèrdie, j’touônne en ouéthou. les caûques-souothis ont chuchi l’rouoge d’la séthée d’v’lous. les dreines lueuthes d’eune séthée, man soûffl’ye et man suffat. the sunset throws rose petals on the côtils. of the pool which caresses me with a flock of bats. entwined with field bindweed and woody nightshade. have fluttered here and there – summer whirlwinds. roaming the roads at dusk, I turn into a shapeshifting spirit. the bats have sucked the red from the velvet evening. the last tatters of an evening, my breath and my burden. This entry was posted in Uncategorized and tagged À ces sé, Geraint Jennings, Jan Marquis, The Toad and The Donkey. Bookmark the permalink.